Annie Jaffrey: Fall Makeup Tutorial! Some pictures taken right after! It goes so well together and looks elegant! Gorgeous as always :) Love your lip colour! There is one thing which I don´t understand - why don´t you work as a model, Annie? You are so beautiful!!! 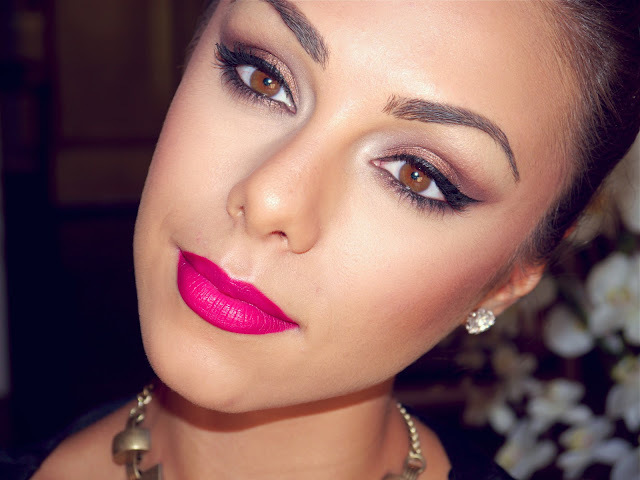 this look is gorgeous and so are you! Woow you look stunning! Your hairstyle and your make up are gorgeous! Love the colour of the lipstick!! Annie you are my inspiration, I adore your style ! Annie, random question: I've started to include avocados in my diet since I've been reading about them in your food logs. I just eat one avocado once a week during lunch at university. I know they are supposed to contain "good fats" but I'm reading stuff on the internet that suggests avocados can make you gain weight. Is that true? Please reply! Thank you. You've got mesmerizing eyes, Annie!! You look so lovely. Your eyes are honestly amazing! Sooooo useful! Any tip for combination/oily skin home-made puryfing mask or scrub? quinine Women should feel beautiful and self-confident without make up too. hey, the lip color in your photos looks a lot more uniform and bright pink than it does in the video, did you add something on top right after? I love this color! Its fantastic!